Day 184 - Cardiff to the Brecon Beacons National Park. 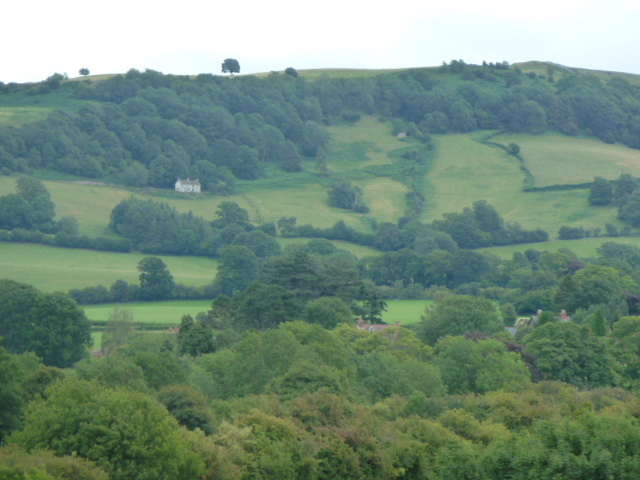 We woke up and got ourselves organised and out the door for our short drive to the Brecon Beacons National Park. With this hire car agreement we paid for the additional driver. Just out of the city Steve pulled over so I could drive! Aaah. In the last 6 months I have only driven twice, both right hand drive cars; one drive for about 10 kms and the other about 1 km if lucky! I was justifiably nervous about driving again and trying to negotiate strange roads in a different country but I managed to get us safely to the National Park office. We looked around the centre and grabbed a map of the area before heading into the town of Brecon for lunch. The local Morrisons supermarket had a park and display car park so we parked there for 2 hours and bought our lunch supplies. We walked down to the Usk River promenade and found a spot to eat our sausage rolls (8 for 1 pound!) and other assorted goodies. It was only about 16 C with a cool breeze and threatening rain so we thought it best to head towards the car with a stop along the way at the local WHSmith bookstore and the local outdoor store for some supplies. 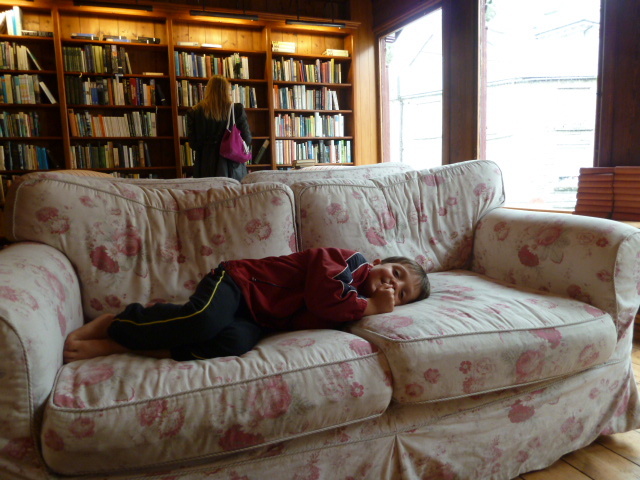 The boys walked away with two Horrible Histories books which Harris has really enjoyed reading – he is the king of trivia. Patrick got a new Lego sticker book which was guaranteed to keep him busy. Steve got some clothing on sale to wear when he goes sailing in September. But we didn’t come to the Brecon Beacons to shop so we went for a drive in search of somewhere to walk. 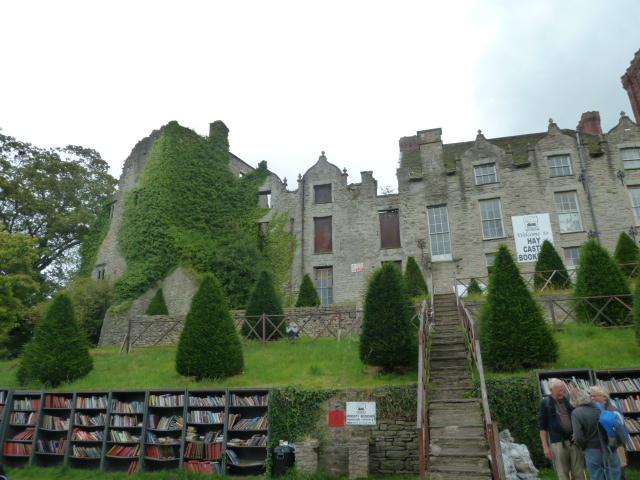 The rain was coming in so we abandoned that idea and drove to Hay-on-Wye instead, a small town famous for having a great number of bookstores. We drove to 30 kms to Hay and parked and walked into town. The town was really ‘cute’ with twisty streets, although not cobbled, but lots of little old buildings that are somehow still standing and are filled with lovely books and gift wares. Patrick especially liked the jigsaw puzzle shop with the puzzle that was 32,000 pieces! I found two books for the boys at the local Oxfam second-hand store for 99p each. Much cheaper than the books being sold in the bookstores. 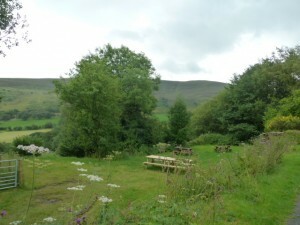 We were ready to check into the hostel by now so we headed back to Brecon and drive 6 miles south to the YHA hostel at Llwyn-y-Celyn. This youth hostel is a renovated farm house and could perhaps do with another renovation but is otherwise clean and cosy. 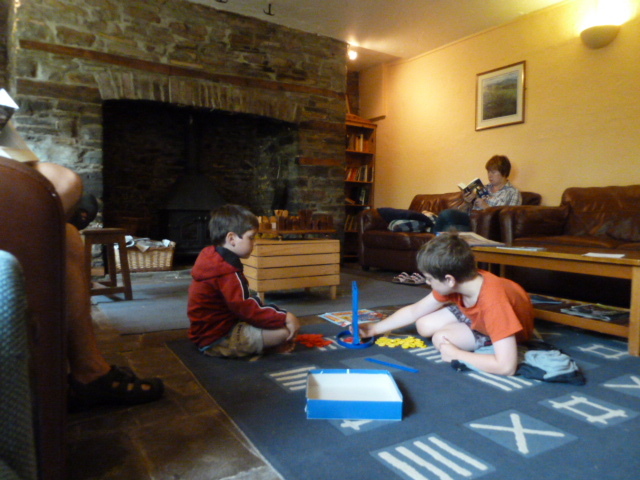 We enjoyed the large kitchen and dining room area for our meals and the lounge with the comfy chairs and fire was nice to sit around and play games and drink hot chocolate! Nicer if we didn’t have to share it with heaps of other people in the hostel but that’s what you get when you pay 60 pounds a night for 4 people. We went to bed with the sound of the rain on our window and the forecast for tomorrow, according to the Met was rain, thunder with hail and a small chance of sunburn!